The College of Education honored four of its outstanding alumni at the 36th Annual Awards Recognition Ceremony on April 12, 2017. These awards are presented annually to graduates of the college who have made outstanding contributions to their profession or the college. Dr. Kyo “Paul” Jhin is the CEO of the eBook/eLibrary Initiative, which sends laptops, tablets, and smart phones to schools in developing nations in Africa and South America. Dr. Jhin has a distinction of receiving appointments from three United States Presidents. President George W. Bush appointed him as the Director of Peace Corps Special Initiatives from 2002 to 2009. President George H. W. Bush appointed Dr. Jhin from 1990 to 1993 as the Executive Assistant to the Secretary of Veteran Affairs, where he helped launch Total Quality Management initiatives in the agency. President Gerald Ford appointed Dr. Jhin from 1976 to 1981 as a Member of the National Advisory Council on Adult Education. In this position, he helped conduct hearings through the nation and testified before the U.S. Congress. 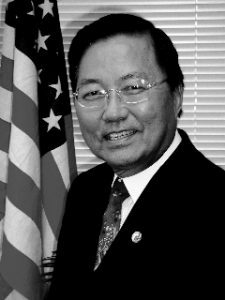 Also in the political realm, Dr. Jhin served as the National Chairman of the Asian American Voters Coalition (AAVC). During 1983 to 1990, Dr. Jhin served as the Assistant Superintendent for Educational Technology in the District of Columbia Public School system. Prior to that, he was the Director of Special Projects at the U.S. Department of Education. Dr. Jhin’s many achievements have been recognized at the international and national levels, honors including “Who’s Who Among Students in American Universities and Colleges and “Outstanding Young Men of America.” He also received “Kukmin-Hunchang Dongpaik-Chang”, the highest civilian award from the Korean President, Kim Dae Jung. He was named “Huntsville’s Outstanding Young Educator of the Year” by the Huntsville Alabama Jaycees and “Alabama’s Outstanding Young Educator of the Year” by the Alabama Jaycees. He also received the prestigious “Distinguished Service Award” from the Federal Council of Asian Pacific Americans. In 1969, the U.S. Junior Chamber of Commerce selected Dr. Jhin as one of four Outstanding Young Educators of America. He was named “Alumnus of the Year” in 2010 by Lipscomb University, in Nashville, TN. In 2015, Dr. Jhin was honored by the National Ethnic Coalition of Organization (NECO) as an Ellis Island Medal of Honor recipient. He was also appointed by the Los Angeles County Board of Supervisors to serve on the Los Angeles County Citizens’ Economy and Efficiency Commission. Dr. Jhin has earned five college degrees: an Associate of Arts degree from Freed-Hardeman University, a Bachelors degree in Mathematics from Lipscomb University, a Master’s degree in Government and International Relations from New York University, a second Master’s degree in Mathematics from Boston College, and a Doctorate degree in Mathematics Education from Auburn University. Dr. Jhin is fluent in English and Korean, and has facility in Japanese and Greek. 2010 Asian Model United Nations Conference in Seoul, Korea; 2009 and 2010 United Nations Global Alliance for ICT for Development conferences; and the 2012 UCLA Model United Nations Conference. He is married to Hyo Bee Jhin. Dr. Pattie Neill is from Birmingham, Alabama where she graduated from Woodlawn High School in 1973 and Auburn University in 1977 with a B. S. Degree in Special Education. She then moved to Tennessee where she worked as a teacher and administrator in Tennessee Public Schools for 30 years. While working in Tennessee, she attended the University of Tennessee, Knoxville, where she earned a Master’s Degree in Special Education in 1979, a School Administration Certificate in 1984 and a Doctorate Degree in 1996 in Leadership Studies. During her 30-year career in Tennessee, Dr. Neill worked as a special education teacher and an elementary school principal in Anderson County Schools, a Director of Student Services and Special Education in Oak Ridge Schools, and Superintendent of Schools in Cumberland County. She is a trained mediator from the Justice Center of Atlanta specializing in Alternative Dispute Resolution, a trained Hearing Officer from the Tennessee State Discipline Hearing Authority, and trained in Crisis Planning from Homeland Security. She served on SACS accreditation committees and Federal pre-Monitoring Teams. She also worked as an adjunct professor for the University of Tennessee, Knoxville, and Tennessee Technological University in Cookeville, TN where she taught Special Education Courses, Curriculum Development, Finance and Facilities Management, and Legal and Ethical Issues in Education. Upon her return to Birmingham in 2007, Dr. Neill worked as a professor at Samford University where she taught leadership classes and trained future school leaders in the Graduate Program for Leadership Studies. She taught Instructional Leadership courses, Management and Program Design, Business Management, Foundations of Educational Research, Policy and Politics in Education, and Organizational Dynamics in the Master’s and Doctoral programs. She served as Chairman of doctoral committees where she directed the dissertation process, and she directed diversity training for the School of Education’s NCATE re-accreditation. During her tenure at Samford, she was a faculty senator from the School of Education and was an active member of Alabama Association of Professors in Educational Leadership (APPEL). She also served as an educational consultant for the Tarrant City School Board superintendent search, and conducted professional development leadership seminars in Montgomery Public Schools, Mountain Brook Schools, Selma City, Lowndes County, Perry County and School Superintendents of Alabama (SSA). Dr. Neill has been Superintendent of Trussville City Schools since 2012 and she has worked with the school board to complete a new high school football stadium, 3 elementary school construction projects, strategic planning, passing a 7 mill tax referendum, organizational management, school culture, curriculum alignment, test score improvement, character education, and anti-bullying initiatives. She received the prestigious Archive Award from the Eastern Women’s Committee of Fifty and is now President of this service organization. She is an avid runner and won first place in her age division in the Maple Leaf 5K run in 2015 and 2016. She is a member of the Auburn University Strategic Athletic Advisory Council, a Life Member of the Auburn Alumni Association, and an active Alpha Omicron Pi alumni from the Auburn Delta Delta Chapter. She is an adjunct professor at Samford University in the School of Education for Graduate Studies in Educational Leadership. Dr. Neill has one son, David, who is a Creative Director for an advertising agency in New York City. Dr. Neill is a resident of Trussville, Alabama. Dr. Elliott obtained his M.S. in Rehabilitation Counseling from Auburn University in 1981, and his Ph.D. in Counseling Psychology from the University of Missouri in 1987. He is a licensed psychologist (in Alabama and Texas) and he is certified by the American Board of Professional Psychology. Throughout his career he studied the adjustment of individuals living with chronic and debilitating health conditions. This work has culminated in over 200 peer-reviewed journal articles, 50 book chapters, external funding from several Federal agencies, and awards for early career and lifetime achievement. He co-edited the first Handbook of Rehabilitation Psychology (2000). He conducted the first randomized clinical trials of a psychological intervention for family caregivers of persons with spinal cord injuries, and of persons with traumatic brain injuries. Colleagues in Germany adapted his intervention protocol for use with family caregivers of stroke survivors. He developed the Telehealth Counseling Clinic at TAMU to provide telepsychology services to remote sites in five Brazos Valley counties designated as health-provider shortage areas. He serves as the clinic’s Executive Director. The Texas Medicaid Home and Community Services program now uses an instrument he helped to develop in determining the personal care service needs of children with severe disabilities. As editor of the journal Rehabilitation Psychology its citation impact factor increased from .80 (2005) to 1.90 (2011). While Editor-in-Chief of the Journal of Clinical Psychology, the scholarly publication attained its highest citation impact factor in its 73-year history (2.23). 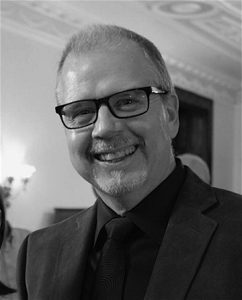 Dr. Elliot is a Fellow of three divisions in the American Psychological Association (the Society of Counseling Psychology, the Division of Rehabilitation Psychology, and the Division of Health Psychology), and he served on the APA Presidential Task Force on Family Caregiving. He served on a Centers for Disease Control committee to prepare its Congressional report on traumatic brain injury and currently he is an invited member of the Defense Health Board Neurological/Behavioral Health Subcommittee. Many of his students have won awards at professional conferences. He has graduated 18 Ph.D. students in his ten years at TAMU. His lifetime achievement awards include the Roger G. Barker Award for Distinguished Research (in 2009) and the Mitch Rosenthal Award for Lifetime Mentorship (in 2015) from the Division of Rehabilitation Psychology in the American Psychological Association, and in 2004 he received the Dorothy Booz Black Award for Outstanding Achievement in Counseling Health Psychology from the Society of Counseling Psychology. According to a recent study, Dr. Elliot is one of the 20 most productive academic counseling psychologists. Dr. Edwards is the Associate Dean of the College of Education at Alabama State University (ASU). In this capacity, she serves as the director of both the Council for Accreditation of Education Programs (CAEP) and the Council for Accreditation of Counseling and Related Educational Programs (CACREP). For those of us involved in accreditations, we know how challenging, meticulous, time-consuming, and important those jobs are. Dr. Edwards’s career in education includes six years as an elementary and middle school counselor and nine years as a counselor educator. While serving in higher education leadership positions, she successfully led the college in two accreditation reviews. In 2014, she led the College of Education faculty and staff in the National Council for Accreditation of Teacher Education (NCATE) accreditation reaffirmation process. In addition to serving as the Associate Dean, Dr. Edwards has served as the coordinator of the counselor education programs at ASU over the last five years. In 2012, she led the faculty in their efforts to build programs that met the standards and requirements of CACREP. Thanks to her leadership, the school counseling and clinical mental health counseling programs received CACREP Accreditation. ASU became the first HBCU in Alabama and the eighth HBCU in the nation to receive this accreditation. Her research interests include school counselor accountability, counseling at-risk students, multicultural counseling, and African-American women faculty experiences. In addition to her duties at the university, Dr. Edwards also devotes her time to professional organizations. She currently serves as a CAEP Site Visitor and Alabama Department of Education Continuous Improvement in Educator Preparation (CIEP) Program Reviewer for School Counseling programs. She is a member of the American School Counselor Association Board of Directors and the Alabama School Counselor Association Executive Board. 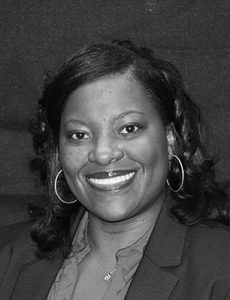 She previously served as president of the Alabama School Counselor Association and the Alabama Association of Multicultural Counseling and Development. 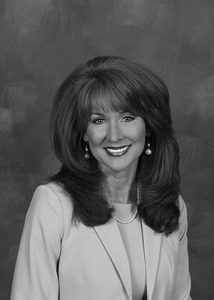 Her commitment extends to the community where she is a member of Junior League of Montgomery and serves on multiple community boards. She enjoys spending her free time with family and friends, especially her daughter and best friend, Ashtyn.